Technical assistance is managed through our online helpdesk where you can find both the documentation and the after-sales assistance, where you can ask your questions for any installation, use or other problems. All our software includes the first year of online technical support by helpdesk. There are two types of credits, those included in the helpdesk assistance plan and the prepaid credits that are purchased from our web shop. 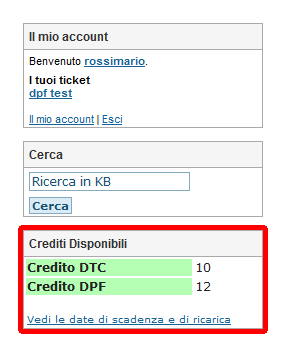 The total credits available are visible on the helpdesk from the side box as shown in Figure 1. Credits included in the assistance plan are subtracted when processing a requested solution that is not included in the list of solutions provided by the software. When requesting multiple services on the same file the supplements with lower credit have 50% discount. Example: DPF OFF + VMAX OFF = 4 Credit + 2 Credit (here we apply the 50% discount) = 5 total credits cost for processing this file. Opening hours are from Monday to Friday, 09:00 to 13:00 and 15:00 to 19:00.